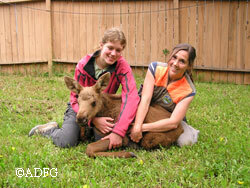 Intern Alena Gerleck and wildlife biologist Jessy Coltrane with a moose calf. Fish and Game staff biologists are usually able to reunite calves with their mothers when they are separated. Photo by Rick Sinnott. The bawling moose calf was not orphaned or abandoned, just lonesome. But he was in the backyard of an Anchorage home, and the ruckus was freaking out the homeowners. They called the Department of Fish and Game, but while talking to the biologist, the mother reconnected with her baby and they disappeared. The truth is they generally are safe. But every spring, the Department of Fish and Game receives scores of calls to come and rescue “abandoned and orphaned” moose calves. Every year, well-meaning people doom moose calves to an unnatural life in confinement – or kill them accidently – by “rescuing” them. It’s dangerous and unnecessary. This is especially a problem in Anchorage, where lots of people and moose coexist. That means that cow moose and calves must also contend with cars, roads, fences and dogs. Sinnott and his colleague Jessy Coltrane have had great success reuniting moose calves with their mothers. As a team, they’ve learned some tricks over the years, and they’ve experienced some sketchy situations. Sinnott said it’s important the calf be reunited to the right cow – its mother – as another cow may kill a calf that’s not her own. In some situations, where a cow has been killed by a vehicle and the calf is truly an orphan, calves may be placed in a zoo or other facility. But it’s also common that after numerous attempts to find a placement, none is available. The situation is a little different in wild areas, away from dogs and fences and urban hustle. But people make the same mistake. Sinnott said that more and more often, he’s finding that people are responding appropriately to moose calves. Although he still gets plenty of calls, often it’s situations where he and Coltrane can help reunite a cow and calf, rather than respond to a demand they capture and “rescue” the animal. “I think a lot of people are getting it, a lot of people know better,” he said. Riley Woodford is the editor of Alaska Fish and Wildlife News.